While the lawsuit filed Oct. 1 by Frank and Elfriede Stronach against their daughter Belinda over her management of the family's privately held business and various trusts plays out in Ontario Superior Court in Canada, Belinda Stronach and the management team she has assembled at The Stronach Group are moving forward with strategic, long-range plans for the company's assets. Those assets include some of horse racing's most valuable properties: Gulfstream Park in Florida, Laurel Park and Pimlico in Maryland, Santa Anita and Golden Gate Fields in California, training centers in Maryland and Florida, totalizator company AmTote and its historical horse racing wagering brand PariMAX, and the advance deposit wagering company Xpressbet. The lawsuit alleges mismanagement by Belinda Stronach, who in 2013 succeeded her father to become chairman of The Stronach Group, and by Alon Ossip, who served as the company's chief executive officer under the chairmanship of both Frank and Belinda Stronach. Belinda Stronach said the charges will be proven “untrue” while a spokesman for Ossip said the allegations are “baseless.” A second lawsuit, filed against Belinda Stronach and Ossip by Belinda's younger brother, Andrew, is similar in nature to the suit filed by the elder Stronach, who built the family's fortune through an automobile parts business, Magna International. Both suits allege liquidity issues within The Stronach Group. The lawsuits come at a time when The Stronach Group's primary racing properties are experiencing across-the-board growth. The company has been renovating Laurel Park with an eye toward hosting a future Breeders' Cup. 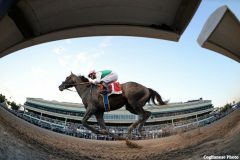 Gulfstream Park has created a major racing event, the Pegasus World Cup, which will have its third running Jan. 26, 2019. Santa Anita and Golden Gate Fields reported gains in pari-mutuel wagering in their recent meetings after being stagnant for a number of years. A former member of Parliament in Canada and CEO of the automobile company Magna International, Belinda Stronach and Tim Ritvo, chief operating officer of The Stronach Group's Racing & Gaming division, recently sat down with Paulick Report publisher Ray Paulick to discuss the present and future of both The Stronach Group and horse racing. Belinda Stronach: It's been an exciting couple of years. We love a challenge. We have a great team and have great momentum. There's real energy within the company. People see the potential. When we first took the company over there were a lot of financial challenges. Tim (Ritvo) and Alon Ossip and the operations team did a phenomenal job in terms of turning the company around from one that was in bankruptcy. Our focus now is to continue to excel on the racing operations side in working with our stakeholders, but it's also looking into how do we introduce this sport to a whole new generation of fans and really focus on the guest experience – both in venue and the digital guest experience. As you know, we all carry a digital device these days, whether it's a tablet or a phone, so a big priority for us is to be able to introduce those new fans to the wagering experience with a new, simple, much easier to understand way to get involved, to understand horse racing, assist with the handicapping. So at the end of the day it would be a new app that has one wallet that will have the potential for someone to be able to wager, depending on whether you're new at wagering or are a sophisticated handicapper, and there will also be in venue features and we hope, ultimately, the sports book as well. All of that would be on one device. Tim Ritvo: It's worth mentioning that the bench strength Belinda is bringing in – the real estate teams and the hospitality teams – is really wonderful for me. How do we better use technology, whether it's wagering apps or the racing opportunities and experiences at the track. We are topping off what we've done to seed the growth, rather than leaving it as it is. How do we take it to the next level? She is bringing in great bench strength, with a chief technology officer, real estate, entertainment executives. Belinda Stronach: We've got a head of entertainment, Jimmy Vargas, a really experienced person who on big race days can create that festival type of of racing experience and have music that coincides with the event. We've got a new head of VIP hospitality food and beverage, looking at each and every track so that the customer experience will be a great one. There's a lot behind the scenes that we are looking at and figuring out the way to go forward. In 2019, starting with Pegasus and into the second and third quarter, you're going to see a revitalization of a number of things, both at our venues and with our digital assets – a much better digital platform to engage our customers. That's a big, big focus for us to make sure we can simplify wagering whether it's on track or off track. We're making a huge investment in digital, where we are playing catch-up. I think the whole industry is playing catch-up in digital. We want to make sure we can really accommodate the 20 to 40 crowd. As a management team, we are looking at the ecosystem. Every single property we are master planning out with the view that we can continue to make racing more sustainable. We want to build up the surrounding properties with a live, work and play ecosystem – as we keep calling it – to make sure that we bring that new energy and new fans to racing. At the same time, the racetrack can become an amenity to the live, work and play community that surrounds it. The thesis is that we will continue to invest in racing, that it can be more viable. We really want to introduce it to a whole new set of fans, and we are looking at every single aspect of what we have to do: the guest experience in-venue, hospitality, food and beverage, events, digital, mobile apps, wayfinding – all of those things to be able to attract a new generation of fans to our great sport. When I talk about the ecosystem, the goal is to intelligently build up each one of these properties so that racing can thrive, the community around it can thrive. They can work in tandem. Part of this, then, will be to have a quality, state-of-the-art training center very close to the track where the day-to-day training can take place and have a ship-in, ship-out scenario for racing. That's part of the philosophy and part of the ecosystem. 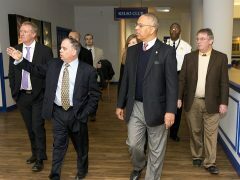 That's something we're looking at in Maryland, reviving the Bowie training center. Tim Ritvo: We'd like to take Bowie to the level of Palm Meadows (in Florida), with a swimming pool for the horses, nuclear scintigraphy, things like that. Tim Ritvo: We're looking for land. Obviously, we're looking at Fairplex (in Pomona) but would rather own the property if we could ever find it. It's going to be a struggle there because the property values are so high, but we are looking. We are looking at Galway Downs, we're looking at opportunities for how we can build a beautiful training center. We need a training center, period, because there's not enough opportunity out there for horsemen and we need to figure out how to fix that. Belinda Stronach: What you see today is not what you're goint to see over the next five, 10 or 15 years. We've undergone a very extensive master planning exercise already with Gulfstream Park and a lot of thinking went into it with Bill Hecht, Tim and the operations team because it all has to work synergistically together. We have a really exciting master plan for the area: a refresh of the mall – the Village as we call it – so it will be an upgrade, a modernization to that facility. We are enhancing the experience within the grandstand. There will be a couple of hotels on the property, multi-family homes on the property as well, some expanded retail, but more on the F & B (food and beverage) and amenities side for the residents living there. There will be a big outdoor concert venue in the Pegasus Park area. Tim Ritvo: Gulfstream was the first of its kind. We made some mistakes, and we'll make some adjustments, having learned from those mistakes on how we can deliver better integration on all of the property. From vertical transportation of how to get people around, wayfind … all of that we are learning a lot from so anything you do a second time obviously you will be better at. Belinda Stronach: We are doing this with every single property. I would say Gulfstream is the most advanced because we've done that master plan already and we are the master developer and working with other companies and developers, whether it be multi-family, retail or the hotel. With Laurel, we are looking at the master plan. How can we make sure that the track feeds the surrounding development and vice versa? So that it really works, not competitively, but works together in tandem and creates a synergy. That exercise is currently happening at Laurel. Santa Anita is a bit of a longer-term plan, but that's the next one to do. We'll look at that in the future, but right now the emphasis is Gulfstream Park and Laurel. Maryland Lt. Gov. Boyd Rutherford (third from left) visiting Laurel Park with Stronach Group executives Mike Rogers, Tim Ritvo and Sal Sinatra. Belinda Stronach: I think the first point to address is that in the racing, gaming and entertainment business – and we always include entertainment because we have to create that compelling entertainment product of which horse racing and wagering is definitely at the core – we have phenomenal momentum. The family brought the company out of bankruptcy; it was losing a significant amount of money at the time. The team did a great job turning that around and we continue on a very positive trajectory. We make profits, we'll continue to make profits, we'll continue to reinvest in the industry and make sure that we really have a model that's sustainable and profitable for the future.We have a really good plan for that. So any reports of liquidity issues are false, in my opinion. Like any business, though, when you have newer businesses it's important to take a look at what is the plan for success, what is the business plan to support those new initiatives, and when will it eventually see a return on investment. That's a process that one undergoes when having an idea for a business, then continuously looks at how to make it viable. That's something as a management team we do, and if we can see a way to profitability, then that's something we continue to invest in and support, and if we can't see our way to profitability, that's something that we as a management team have a responsibility to deal with on behalf of the entire company and employees. We have to run a good show, and that's what this management team has been doing. Tim Ritvo: We're a fully integrated company, too, where AmTote processes 80 percent of the bets; we have historical horse racing machines with PariMAX and Xpressbet for advance deposit wagering, so we are fully engaged. The reason to bring in a chief technology officer is how do you create new bets, how do you create friendly platforms, so when we do something right, it's not just good for The Stronach Group. Belinda Stronach: It's good for the industry. We are making major reinvestments for the future. We're doing it because we believe in the industry and it makes commercial sense to do that, it makes business sense. Belinda Stronach: It's roughly 95,000 acres of land in the Ocala area designed to underpin a farm-to-table grass-fed beef operation. Tim Ritvo: There are complete firewalls in place. These firewalls are put in place to protect the racing business. Belinda Stronach: Each of our vertical businesses – for example, racing, gaming and entertainment – has to be a complete standalone, viable business with a dedicated management team that is aligned not only for short-term profits but long term, to do the right thing to create a sustainable business. It is run as an independent business. Same thing as the real estate development company that Bill Hecht heads up. That has a dedicated management team with the expertise of real estate development and is a standalone business. Obviously, because of the relationship between racing and gaming and real estate – we are neighbors – to maximize the potential of that real estate, it's wise to work together, it makes financial sense to do that. Tim Ritvo: Our goal is 2022. From a political standpoint, the governor, his staff … they're all in. They want it here. Belinda Stronach: They would take great pride in having it at Laurel. Tim Ritvo: We're showing Breeders' Cup officials the venue, the plan and how we're going to build it out. It's important to us, because it gives real credibility to Maryland racing again. Maryland racing struggled through some years and it's really started to come back, but now if we would get an event like the Breeders' Cup and bring back the D.C. International it puts Maryland back on the map. Tim Ritvo: The surrounding area would probably be the smallest of any Breeders' Cup, and people would have to stay in Baltimore or Washington, D.C., but it's only 30 or 40 minutes away. Other than that, there's no negative. We have a great grass course, a great dirt track. We've done a 15-year analysis of weather that time of year and the weather is perfect. We have challenged the Breeders' Cup, asking them what are the negatives, what do we need to fix? Belinda Stronach: By 2020, this entire facility will be refurbished and renovated with suites and all kinds of cool things for the venue so we will be able to accommodate more premium spaces. Tim Ritvo: We're learning, not from our own facilities but from everyone else who has hosted – Del Mar, Keeneland. What did they do right, what did they do wrong. Let's learn from what they did when we build the place out. Premium quality seats is what people want – that experience; It's not a $50 seat in the bleachers any more. People want more of an experience when they attend. Tim Ritvo: In fairness we want to wait for the Maryland Stadium Authority to finish its study, which will come out right after the election. We're interested to see what the cost would be to rebuild Pimlico. From a business standpoint, as a private company, it makes no sense to maintain and operate two facilities. Even with a racing company like NYRA, eventually we're going to see Aqueduct go away. Belinda Stronach: It's very challenging to operate and have the overhead of two facilities as opposed to investing in one and having a super track with all the amenities. That would allow us to really cater to our customer, to have a training center nearby to cater to our horsemen and our horse community, and to potentially host major events that offer a premium experience. Tim Ritvo: From a horseman's perspective, when the Preakness runs, people fly in from all over the world, they see what you have to offer at Pimlico and they leave and never even come over to Laurel. 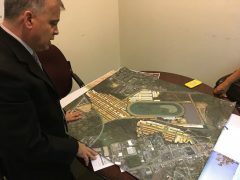 Imagine if the Preakness was run (at Laurel) and those same people experience all the amenities we have at Laurel, your business is going to grow. Horsemen are going to get more horses, trainers are going to say, that's a place I want to entertain clients. You don't get that experience at Pimlico where the Preakness is today. The good news is everyone does not want to kick the can down the road any more; they know it's not sustainable for the experience that it should be. We'll have to see how the study comes back and what the political environment is after that. I always want to give the customer what they deserve at a Triple Crown event, and we're not able to do that at Pimlico. Tim Ritvo: It's in the works. We will be applying for it at the California Horse Racing Board meeting. We'll be putting it into our license application and we believe we would be on solid ground legally with historical racing because it is based on the outcome of a historical horse race. They are not slot machines, they are historical racing machines, and we think they would be an added amenity to the entire property from a bunch of different perspectives. They would drive pari-mutuel wagering and handle by having more people come to the facility, generate purse money. California is one of the only places where “A level” tracks compete without a subsidy (from slots or casino gaming). Also, when you look at the development component, if we are successful, then hotel operators start to look at the facility and incorporate the entire master plan of what we are looking at. Belinda Stronach: It's another product offering, another amenity for the guests that come to our venues. It's a derivative of the platform we already have. Tim Ritvo: We're working with our lobbying teams in every state because it's important to us. We're not even sure what the revenue driver of that will be. Obviously we think it would be decent, but it's not just that. It's an added amenity for the experience. So if we can get people to come out and watch football and understand what a pari-mutuel wager is, how horse racing works and what the experience is like, that's what I'm looking forward to as an operator. 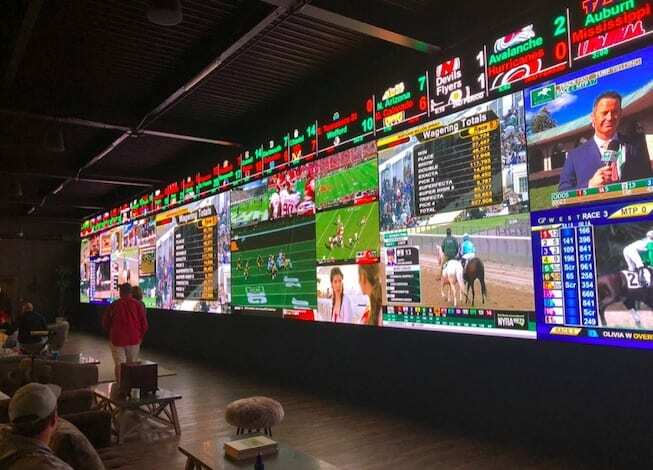 I'm sure with sports betting margins being much slimmer than on a pari-mutuel wager, that it would take time to figure out how you're going to drive revenue, but the idea is the experience, having an opportunity to provide that customer with the added amenity. Belinda Stronach: Horse racing and pari-mutuel wagering is our core business, but we'd like to have other product offerings for our customers and guests. Ideally it's on a digital device so you don't have to leave the app; one wallet for horses and sports, so you can keep that relationship with your customer in-venue or digital. It's all about an enhanced guest experience. Tim Ritvo: I think it's important to understand that Maryland really got it right. When Maryland came up with legislation for casinos, the contributions went to purses and to the tracks, but the only way they contribute to our end of it is if we invest with them. Whereas other places that have become racinos, racing got put off to the side and the casinos have expanded. In Maryland, the racing industry is on really good growth and the casino industry is doing well, so they created two healthy industries. That's the same as sports wagering. When we talk about sports wagering, sure, the casinos should be allowed to get it, and the horse tracks should be allowed to get it, to help both industries equally. When we go out there and battle for sports wagering, the casinos may not want to share because they believe it's a casino wager. We don't think so. We see it as a new form of gaming and entertainment and believe the tracks should get an equal shot with the casinos. I feel good working for this company, because we've proven that any subsidy or amenity that we get, we invest in what we really love, which is racing. Tim Ritvo: We are always looking for new markets. Massachusetts is still viable, though it will take some heavy investment and legislative changes. We are also looking at what we did at Calder. Can we operate facilities (owned by other companies)? Maybe there are racinos out there that just want to work and focus on the casino part of it. We can come in and say how can we integrate the racing program? Obviously we are talking to Colonial Downs now that they've got historical racing in play (and will resume live racing). We know there's going to be consolidation, that there's not enough horses for everybody, and we know that short fields aren't good for anybody. So how do we work together with the industry to make a stronger product and be more viable and sustainable in the long run? Belinda Stronach: What I love about our team is that status quo is never really an option. We are always thinking: what did we learn and how can we do things better to create a better business and more sustainable industry? We are huge investors in this sport, so how can we do things better? Tim Ritvo: Belinda's passion is not just for growing the business, but it's also the health and equine issues in the industry. She knows that's maybe our most vulnerable aspect. How do we as an industry do the right thing? Belinda Stronach: We have to come together as an industry and have extremely high standards. It's just the right thing to do, to take care of our jockeys and our equine athletes. People care. If they are going to be engaged in this sport, they want to make sure the sport has integrity, not just on the wagering side. People want to be part of something that's done right, has good values and good principles. Belinda Stronach: Thoroughbred racing is the last great sporting legacy platform that has not yet modernized. We believe in the future of horse racing: It's an exciting sport, a compelling experience for all, and we are continuing to invest in it. We are excited about the future. It's not just a dream. We can see where it's going. It's paying respect to the traditions of our sport, but looking at areas where we can modernize or evolve or make it contemporary. We have to reach a new audience to make sure this sport continues to evolve and ultimately thrive. I'm not happy with the status quo. We want to knock this out of the park. We will do it right, make investments to achieve that. It's great to have a vision, but you can't do it without great people. It's about building a great team, making sure we're aligned toward the objective. And it goes beyond profits. Profits will be a byproduct if we do all of these things well. This entry was posted in NL Article, Ray's Paddock and tagged Alon Ossip, amtote, Andy Stronach, belinda stronach, bill hecht, bowie training center, Breeders' Cup, Frank Stronach, Golden Gate, gulfstream park, historical horse racing, jimmy vargas, laurel park, maryland stadium authority, palm meadows, parimax, pimlico, preakness, santa anita, stronach lawsuit, The Stronach Group, xpressbet by Ray Paulick. Bookmark the permalink.